This year we are launching a large-scale conservation programme to secure the future of the building by addressing major concerns about the roof. The Cathedral will remain open for worship and visitors throughout the conservation project. This will be one of the biggest conservation projects undertaken in Ireland and is estimated to cost €9 million. The Cathedral has already raised €5 million and is appealing to the public to become involved in this exciting chapter in the Cathedral’s history by sponsoring the project. 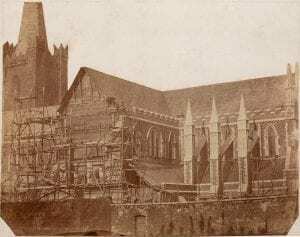 The high roof replacement will be the most significant conservation project undertaken by the Cathedral since the Guinness restoration 150 years ago, during which Sir Benjamin Lee Guinness funded a full-scale restoration of the building. Every year Saint Patrick’s Cathedral welcomes over 600,000 visitors from all over the world, which makes it among the most popular heritage attractions in the country. To support us during this exciting chapter in our history. click here.